Questions about how and when stars are formed continue to tug at human curiosity. Star formation is governed by gravity and heat. Gravity causes molecular clouds to collapse and eventually form stars and planetary systems, but to complete the process, heat needs to be continuously removed from the cloud. Hence, ionized carbon and neutral oxygen—the two major coolants of the interstellar medium (ISM)—are the best indicators of star-forming regions. New technology is being developed that will allow spaceborne telescopes to make high-resolution multi-pixel maps of the universe, which will help scientists understand why star and planet formation is common in some regions of the universe, while other regions are dormant. The technology utilizes state-ofthe- art Schottky diodes that enable a space telescope to observe and map deep-space regions. The Schottky diodes work at the frequencies required to detect ionized carbon and neutral oxygen—1.9 and 2.06 THz respectively. 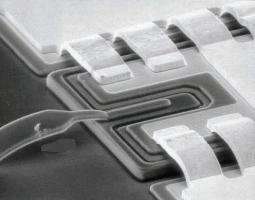 The smallest feature of these diodes is less than one micron (a human hair is typically 50 microns in diameter). To date, only a single-pixel receiver has been flown in space. The multi-pixel technology NASA is developing allows tens and hundreds of these Schottky diodes to be packaged in metal enclosures, which will allow scientists to map large areas of the sky simultaneously. In 2016, NASA researchers demonstrated the first 16-pixel camera that worked at 1.9 THz. 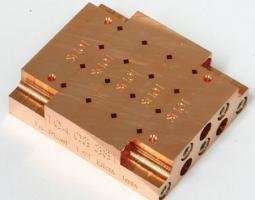 To implement multi-pixel THz cameras, the development team investigated a concept for packaging the diodes in very precisely machined thin metallic plates that are then stacked. To create a 16-pixel source, five metal plates—each about 5 mm thick—must be machined very precisely to obtain alignment tolerances better than 10 microns. This multi-pixel far-infrared technology will enable NASA space telescopes to take "pictures" of the universe that will allow scientists to better understand the chemical and physical processes involved in the birth of new stars. Now that the first 16-pixel camera has been demonstrated, the NASA team is working to increase the sensitivity and pixel count so that the technology can be used on future NASA space missions.